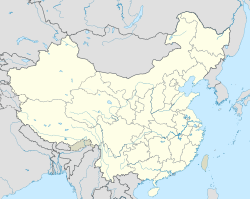 Chaozhou (Cheenese: 潮州; pinyin: Cháozhōu; Wade–Giles: Ch'ao²-chou¹; leeterally: "Tide Prefecture"; alternatively spelled Chiuchow, transliteratti frae its Cantonese pronunciation; an aa widely kent bi its Postal map spellin Teochew,) is a ceety in eastren Guangdong province o the Fowkrepublic o Cheenae. It borders Shantou tae the sooth, Jieyang tae the soothwast, Meizhou tae the northwast, the province o Fujian tae the east, an the Sooth Cheenae Sea tae the sootheast. It is admeenistered as a prefecture-level ceety wi a jurisdiction aurie o 3,614 square kilometers an a total population o 2,500,000. Chaozhou is part of the Chaoshan region. Wikimedia Commons haes media relatit tae Chaozhou.